Canaling boating - one couple's tales. 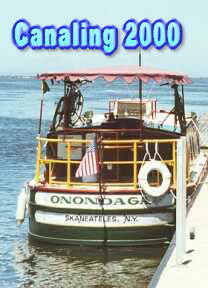 For our first time canaling in June, 1999, we started with the Erie Canal in New York State using a hireboat from Mid-Lakes Navigation. 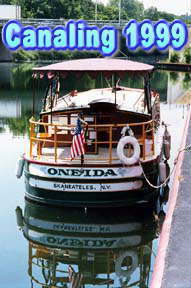 Our voyage also took us to the Oswego and Cayuga-Seneca Canals. We returned for a second look the next year and managed to cruise on all three canals again. It's habit forming. This time we went farther west to just short of downtown Rochester, New York. A click on either boat will start that year's travelogue. Navigation links are on the bottoms of the pages that follow. Who knows where we might turn up next. The U.K. is in our sights for a turn at narrowboating. Paul & Ginnie Smith of Colchester, Vermont U.S.A.